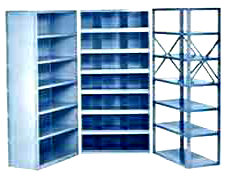 Since 1958, Dixie Shelving has been a leading supplier of durable, high value shelving. 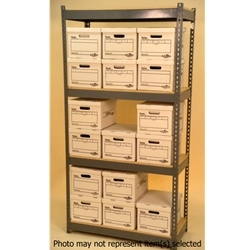 Government project suppliers and school shelving contractors have consistently kept Dixie Shelving on the Preferred or Approved lists for many decades. The low maintenance designs and high strength components have stood the test of time, pleasing our warehouse and industrial clients as well. Dixie Shelving products are also greatly appreciated by household users due to the ease of assembly provided. For hard use, economical value and ease of assembly, Dixie Shelving stands above the rest year after year. Customer satisfaction is the foundation of our reputation. Quality products, and knowledgeable, friendly staff at Dixie Shelving guarantee your complete satisfaction. Please contact us at (713) 957.1111with any questions you have about steel shelving, widespan shelving, rivet shelving and other Dixie Shelving products. 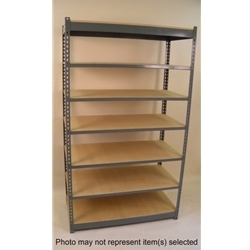 Dixie Widespan, sometimes referred to as Rivet Shelving or Boltless Shelving, is commonly used in applications that require high load capacity in widths beyond what standard metal shelving is available in. Dixie Low Profile Rivet Shelving is a hybrid design combining the strength features of Widespan shelving and the narrow face design of metal shelving units.